I am so excited that Poppy clothing range, has grown up . . . with a range for adults for Spring/Summer 2012! POPPY, the British clothing range that depicts a little girl’s adventures on the hem of its dresses, has responded to popular demand and launched a range for women. Designer Bryony Richardson’s distinctive prints feature the nostalgic antics of young Poppy and her loyal dog, Fred. The children’s range for which the firm has gained a loyal following features a circus theme for the current season and a patriotic London one for Autumn/Winter 2012. After many requests from mothers and others for adults’ dresses to match the mini versions, Bryony and her team tested the water with some trial designs late last year. Spring/Summer 2012 with new styles, prints and colours. Sizes range from 10 to 18. The dresses are available from a growing network of independent boutiques as well as online at www.poppychildren.co.uk, where they are priced at £98 – wrapped beautifully and delivered free. Bryony said the grown-up versions had already been picked up by adult bridesmaids – Poppy’s pretty girls’ dresses have long proved popular for flower girls and for other special occasions. “The idea had always been there for a women’s dress – it’s amazing how many mums love the idea of dressing to match their daughters,” she said. A range of women’s tulle petticoats is proving a great accessory to the dresses too, giving them volume and a touch of 50s’ style, or they are great just worn on their own. Available in four colours, they come in one size and are £59. An early-adopting stockist already enjoying success with the new women’s range is The Whiting Post, a delightfully quirky vintage-inspired independent clothing and homeware shop in Whitstable, Kent. 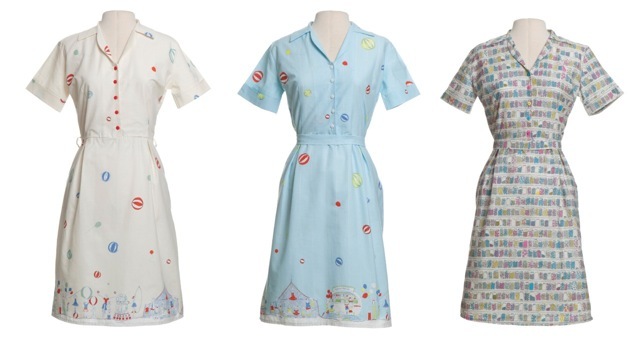 Manager Kara-Louise Adams said the dresses had crowd-drawing qualities when placed in their Harbour Street store window – especially when teamed up with vintage props such as a 1950s kitchenette. “I first saw the dresses on Bryony and her colleague, Hannah Martland, at a London trade show last year and I remember thinking: ‘that’s the most unique thing I’ve seen in a long time’,” she recalled. For SS12, Poppy and Fred join a circus to learn some tricks and meet new friends under the big top. Meanwhile, they also try their hand at running a traditional sweet shop, complete with jar upon jar of old-fashioned sweets. Two fresh spring colourways in the new Circus print feature Lemon Sherbet and Spearmint in the Beatrice design, while multi-coloured Sweet Shop provides a fascinating complement in both the Beatrice and Edith styles. The new fabrics complement the firm’s popular Seaside print in blue, red or green in the Beatrice style, as well as the Poppy print – available in a long-sleeved Beatrice design and a short-sleeved Grace version. The printed-in-Leicester quality cotton twill is comfortable and machine washable. 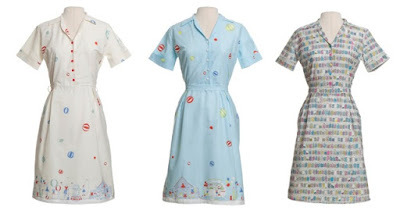 As with the girls’ outfits, each charming dress comes with a storybook telling the tale of Poppy and Fred’s exploits. Bryony’s hand-drawn illustrations give Poppy clothing its trademark nostalgic innocence –complete with a contemporary twist: a Pippi Longstocking for the 21st century. In addition to clothing for women and babies, boys and girls aged up to seven – Poppy has a range of accessories such as pyjamas, little purse bags, berets and bootees, colouring books, greetings cards and invitations, and mugs. For further information, interviews, price lists, stockist details and samples, please contact Gareth Dant via email: gareth@poppychildren.co.uk, or telephone: 01609 765149.
www.poppychildren.co.uk. 44 High Street, Yarm, North Yorkshire, TS15 9AE. 01642 790000. You can also visit them on Facebook (www.facebook.com/poppychildren) or follow them on Twitter (@poppychildren).